By far the most meaningful flag-waving I've ever done. This time last year, I was in Israel celebrating Israel’s Independence Day (I guess to be exact, it had already ended at this point), which is a holiday like no other. It was, of course, a ton of fun, but one incident still stands out to me, and I wrote about it immediately following what happened. The events of the past year alone have made it all too clear that those who deny the necessity of a Jewish state are deluding themselves. What I didn’t mention in the article below (that I edited slightly to reflect how I’m no longer in Israel) is that at the end of the interaction that Gefen and I had with these anti-Israel fellows ended because they threatened to beat us with their crude, makeshift weapons (it was originally published under the title “Countering the Nakba Narrative”). As much as the police told us they were cheering us on, they also said that we couldn’t approach the protest site until it was over. So much for open discourse. Ladies and gentlemen, I present the anti-Israel media bias up close and personal. After the thousandth person called me a baby killer I noticed they were wearing a media badge, so I decided to ask him about Hamas's use of human shields, which he denied. Then Mr. Green Shirt threatened to shatter my iPad and tried to gut punch me (notice when the camera angle goes down a little) after someone told me that my presence there "wasn't worth it." Excuse me, since when is my First Amendment right negotiable? Unfortunately, this is a trend that’s all too familiar in America as well, as I unfortunately witnessed in person when a Marine was assaulted in front of the White House for daring to wave American and Israeli flags in the face of tens of thousands of anti-Israel protesters (for my Jerusalem Post OpEd about that, look no further). I still can’t think of a better way to have spent my last day of childhood. With all of that said, I wish Israel nothing but the best for its upcoming 67th year! This Yom HaAtzmaut, I was treated to an interesting spectacle of Palestinian tolerance. 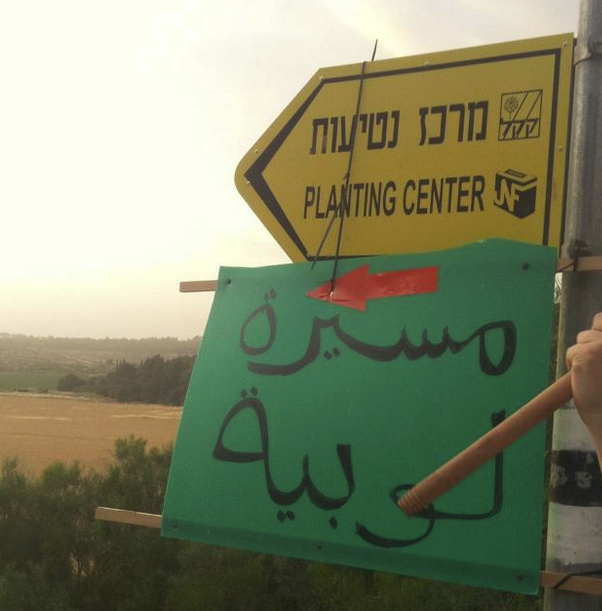 It is no secret that some (but by no means all) Arabs living in Israel take to the streets every year on the same day as Israel’s independence to commemorate the nakba. Allow me to take a brief moment to explain what the nakba is. It seems to me that its true definition is whitewashed all too commonly. The only thing that the nakba is is a commemoration of the failed war of aggression launched by the Arab countries surrounding Israel moments after its creation. As such, there was a large traffic jam caused by a nakba protest outside the youth village of Hodayot where I was volunteering. Once our bus finally pulled in, my friend Gefen and I saw that the protest was actually at the bottom of a long hill that leads up to our village. 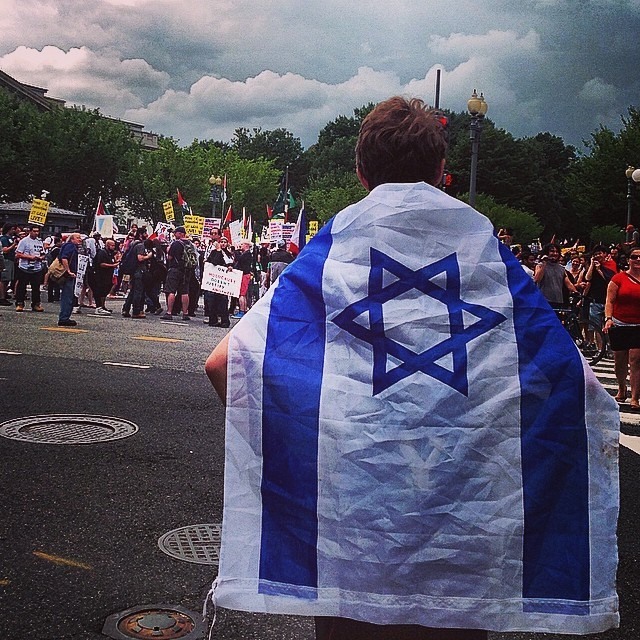 After disembarking the bus, we took two large Israeli flags and ran down the hill to counter protest. 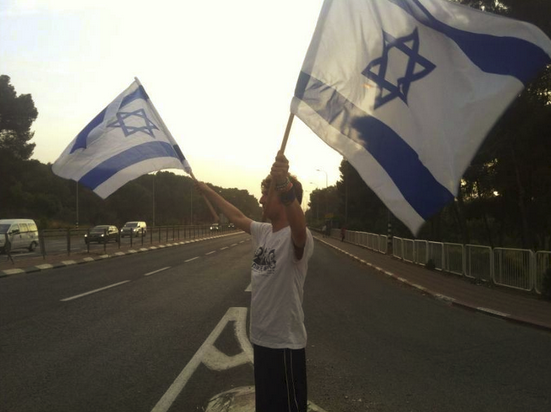 Along the way, several Israelis were walking, and they wished us good luck. Sadly, the police told us as soon as we reached the bottom of the hill that we couldn’t wave our Israeli flags here, no matter how much they agreed with us. Instead of sulking back up the hill, we walked over to the nearby street and waved them for a while. As if the protesters didn’t embarrass themselves enough with their other actions, their geographical confusion was the icing on the cake. It comes as no shock to me that Israel’s detractors have no sense of history of the region, but the plain stupidity of this particular group of people is particularly worrisome. 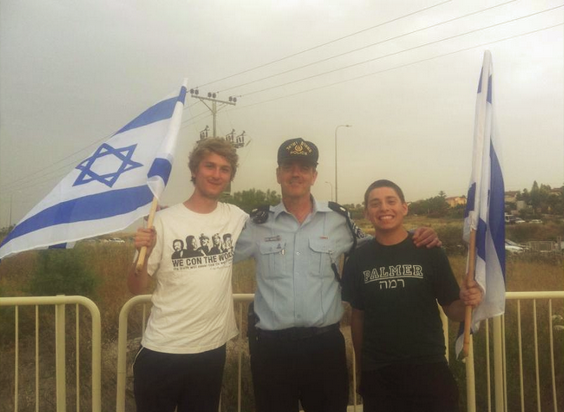 These are the people Israel is expected to live side by side with. My worries stem from the fact that, rather than seeking to have a civil discussion with them about the errors of, well, everything they just said, they spat their cigarettes at us and brandished a very odd metal club of sorts, and we realized it was time to go. It’s hard for me to imagine my Fourth of July barbeque being interrupted by nationwide demonstrations against my right to exist as an American, but it is the sad reality that Israelis are forced to spend one of the happiest days of their year, knowing that there are all too many out there who are unwilling to see it celebrate a 67th birthday and a week after its celebrations, I think that its lessons are as important as ever. By far the most meaningful flag-waving I’ve ever done.